Built as a hunting lodge for the Archbishops of Salzburg in 1450, the property enjoyed nearly 400 years of aristocratic fun until the Habsburgs dissolved the clerical principality of Salzburg. In 1833 the castle passed to the Imperial government, which let it fall into ruins. In 1938 the Nazis, who had already set up headquarters in Klessheim Palace in Salzburg, seized Schloss Fuschl, converting it into a residence for German foreign minister von Ribbentrop. After the war, a widespread rumor claimed that crates of gold were hidden in the bottom of the lake. Despite special instruments combing the lake bottom, nothing has ever been found. If you’re looking for a place to celebrate a special event or live it up, the beauty of the location and quality of service does not disappoint. This is a stunning property. Rates include breakfast, tax and service. Fuschl is 20 km. east of Salzburg on Route 158. The hotel can chauffeur you in one of its vintage Rolls Royces. A public bus runs regularly between Fuschl and Salzburg, as well. Surrounded by woodland and a nature reserve, Schloss Fuschl sits on a small peninsula that extends out onto Fuschlsee—Lake Fuschl. Since the castle opened its doors to paying guests over 50 years ago, it has maintained a reputation of an elegant five-star resort hotel. Guest rooms on the property can be located in the main castle, an adjacent building, or in a private cottage on the lake. If you’re looking for a special splurge, the spacious antique-filled suites inside the original castle boast wonderful lake views. Each is exquisitely furnished in your choice of Renaissance, Empire, Baroque, or Biedermeier styles. 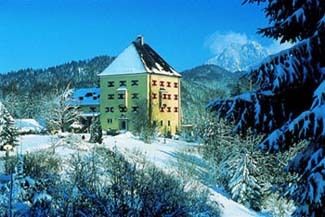 “Country house” rooms in an adjacent building reflect the style of the Salzkammergut region, while each lakeside cottage features a sauna, terrace, and open fireplace. A tree-lined path winds down to the private lakefront where you can enjoy an outdoor swim, or back at the hotel you can take advantage of an indoor pool with a view of the lake. 150 Old Master paintings and drawings from the Bernheimer Gallery in Munich displayed in suites and public rooms.